Classic Richter this. The B Minor Sonata brings out all the qualities that made his playing unique. It is mercurial, tempestuous and volatile, while always finely controlled. And, somehow, he manages to make the music unpredictable as well, quite a feat given the work’s ubiquity and the tight cohesion of its form. Tempos are extreme, the fast sections taken at a real lick, but then suddenly dropping away for the slower lyrical passages, where, on many occasions, time seems to stand still as Richter holds the first translucent chord, before confiding with us the tempo he is to take. Among modern interpreters, only Argerich comes close to this, but even she seems more grounded and rational, though they’re clearly kindred spirits when it comes to Liszt. The rest of the programme is made up of selections from other Liszt works. We get eight Transcendental Studies (Richter was never one for complete sets), “Aux Cyprès de la Villa d’Este” from the Third Book of Annés de Pélerinage, Hungarian Rhapsody No. 17, and Valses Oubliées No.3. Richter can occasionally sound overwrought in some of these miniatures, too serious and symphonic for the music’s more modest ambitions, but he also occasionally finds the lightness the music requires, such as in “Feux follets”, which is given a sprightly and elegant reading. The Sonata was recorded at Carnegie Hall in 1965 (he also made a later, stereo, recording of the work, in 1966) when Richter was clearly at his peak in every respect. The shorter works were recorded in Eastern Europe - Prague, Moscow and Budapest - between 1956 and 1958. Despite the SACD remaster, the sound isn’t great. All, or most, of the tape noise has been removed, but the piano always sounds distant. There are a few pitch glitches in the Transcendental Studies too. Fortunately, Richter’s playing overcomes all obstacles. The sheer immediacy of his playing and the focussed timbres he draws from the piano shine through, and the audio problems are soon forgotten. The Sonata is divided into four tracks, reflecting one interpretation of the work’s structure, although perhaps not a universally accepted one, and the later works follow hard on its heels. (The first note of the Sonata begins the moment you press play, so you don’t get the crotchet rest at the start – in very minor quibble.) The ending of the Valses Oubliées seems a bit of an anticlimax – the programme just tails off rather than ending conclusively. Still, at almost 80 minutes, this is a generous programme, and everything here is well-worth hearing, although the Sonata is clearly the main draw. 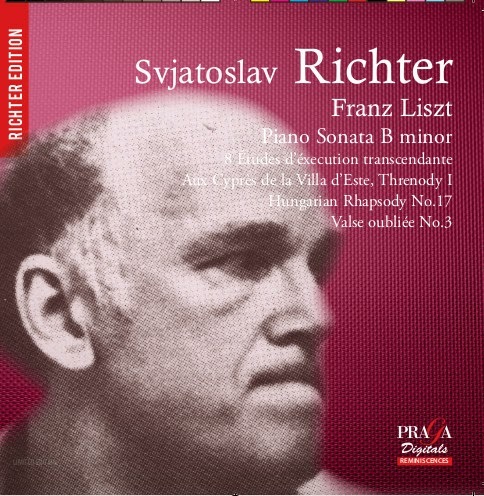 This disc is the first of a series of 12 Praga (Svjatoslav as they call him) Richter releases, all on SACD. The benefits of the format in this context are open to question, but the quality of the playing is not. Recommended.